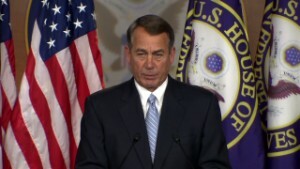 Editor's note: Rep. John Boehner, R-Ohio, is speaker of the House of Representatives. 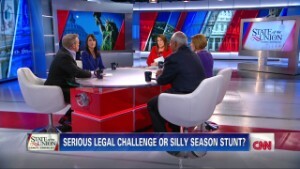 This commentary appeared earlier this year as the House of Representatives prepared to vote on authorizing the speaker to file a lawsuit against the president for delaying implementation of the Affordable Care Act. The opinions expressed in this commentary are solely those of the author. 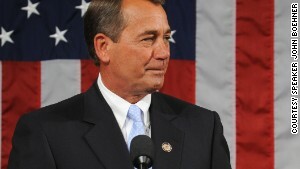 (CNN) -- Every member of Congress swore an oath to preserve, protect and defend the Constitution of the United States. So did President Barack Obama. But too often over the past five years, the President has circumvented the American people and their elected representatives through executive action, changing and creating his own laws, and excusing himself from enforcing statutes he is sworn to uphold -- at times even boasting about his willingness to do it, as if daring the American people to stop him. That's why, later this month, we will bring legislation to the House floor that would authorize the House of Representatives to file suit in an effort to compel President Obama to follow his oath of office and faithfully execute the laws of our country. The President's response: "So sue me." 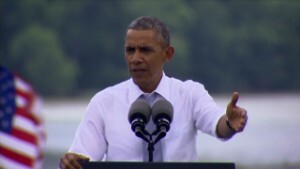 What's disappointing is the President's flippant dismissal of the Constitution we are both sworn to defend. It is utterly beneath the dignity of the office. I know the President is frustrated. I'm frustrated. The American people are frustrated, too. After years of slow economic growth and high unemployment under President Obama, they are still asking, 'where are the jobs?' The House has passed more than 40 jobs bills that would help. But Washington Democrats, led by the President, just ignore them. Even worse, the President's habit of ignoring the law as written hurts our economy and jobs even more. Washington taxes and regulations always make it harder for private sector employers to meet payrolls, invest in new initiatives and create jobs -- but how can those employers plan, invest and grow when the laws are changing on the President's whim at any moment? I don't take the House legal action against the President lightly. We've passed legislation to address this problem (twice), but Senate Democrats, characteristically, have ignored it. In the end, the Constitution makes it clear that the President's job is to faithfully execute the laws. And, in my view, the President has not faithfully executed the laws when it comes to a range of issues, including his health care law, energy regulations, foreign policy and education. There must be accountability. We have a system of government outlined in our Constitution with the executive branch, the legislative branch, and the judicial branch. Congress has its job to do, and so does the President. When there are conflicts like this -- between the legislative branch and the executive branch -- it is my view that it is our responsibility to stand up for this institution in which we serve, and for the Constitution. If you look back over American history, there has always been a tension between the inherent powers of the executive branch versus the inherent powers of the legislative branch. This issue is as old as Marbury vs. Madison and as fresh as the unanimous Supreme Court ruling last week that the President overstepped his authority on recess appointments. Over the last five years, starting -- not coincidentally -- when his political party lost the majority in the House of Representatives, the President has consistently overstepped his authority under the Constitution, and in so doing eroded the power of the legislative branch. The legislative branch has an obligation to defend the rights and responsibilities of the American people, and America's constitutional balance of powers -- before it is too late.